The Many Mini-Adventures of the Wards: Happy 13th Anniversary to us! Happy 13th Anniversary to us! Enjoy another glimpse back into our past. 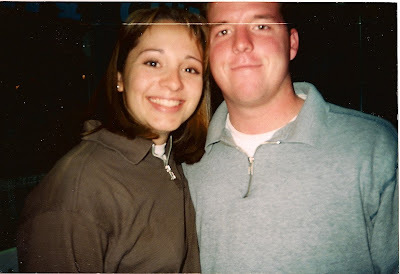 Here is the first snapshot ever taken of us (almost 15 years ago in 1996 or 97). We were dating, so young and so carefree. This was back in the day when he drove around in his sporty Rx-7 and I had my lovely 1982 Honda Prelude. He taught me how to drive a stick shift on our first date. And here we are today. Well, about 6 months ago anyway (at Jordan and Stephanie's wedding). We look the same as in our dating pictures, eh? Just kidding. We're definitely older. More mature. And maybe not so carefree anymore. But I think we've aged beautifully. We are just as happy as when we were first dating, maybe even more. In the beginning phase of our relationship we couldn't stand to be away from each other. That phase hasn't faded one bit. Even after 13 years we can't stand to be apart. We've grown a family, grown through trials great and small, grown a solid relationship, and grown even closer together. I sure hope that teaching you "how to drive a stick shift" isn't a metaphor.